Arizona State Senators John Kavanagh and Steve Smith would like very much to see the police in our state operate in complete secrecy. No accountability. No publicity. After all, police work is much more efficient and effective when it is not encumbered by the United States Constitution. A proposal by Kavanagh, R-Fountain Hills, would make it against the law to shoot video within 20 feet of any “law enforcement activity” unless the officer first gave permission. A first offense would carry a $300 fine, with subsequent violations potentially sending someone to jail for up to six months. John Kavanagh, a Republican who is also a retired cop, said such a law is necessary for officer safety. What are we supposed to do, get out a tape measure before turning on the camcorder? He said he does not see a problem that such a law would make it illegal for citizens to record their own interactions with police, stressing that citizens do not have that right, despite the numerous court rulings that disagree. Sounds to me like it’s to hell with protecting citizens, we need to be protecting cops. If this thing passes, not only would you be denied your constitutional right to photograph a public event, you would be fined and jailed for it. Unless, of course, the cop said it was okay. Now we have our civil liberties being meted out by cops at their discretion. Wow. If you’re subjected to law enforcement authority, submit. That’s a line right out of the KGB hymnal. Smith thinks that a cop who kills someone should be allowed to go into hiding for three months – just until things blow over. 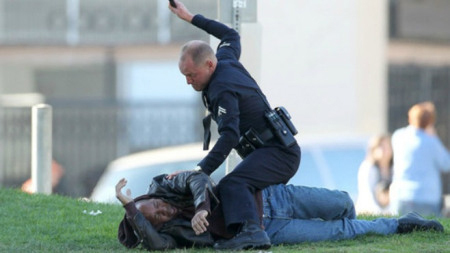 Of course, if it turns out that the officer made a bad call, then all bets are off. And, of course, the officer can “come out” at his own discretion. Smith’s bill, Senate Bill 1445 would prohibit law-enforcement agencies across the state from disclosing the names of officers involved in deadly or excessive use of force incidents for 90 days. This makes no sense. In the case of an officer-involved shooting, an immediate investigation starts immediately to determine whether the shooting was in compliance with department policy and the law. Just like a criminal investigation, it can sometimes take months for a final determination to be made. In a free society, information has to be open and available – especially when it has to do with law enforcement and the prosecution of citizens. Transparency is essential. As we have seen, there is a tendency to cover up mistakes in these instances and who better equipped to alter the truth than law enforcement. We empower the police with a tremendous amount of authority. As such, we hold them to a high standard of conduct and accountability. If someone operates outside the law under the scope of this authority, then we have the right to know immediately, not three months later. 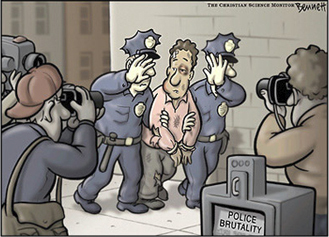 And if there’s a psychopath in uniform who finds himself inclined to use excessive force that what better way to document than then a video camera. The best way to assure the public that police are operating within the law and the scope of their authority is to make their actions completely transparent. The overwhelming majority of officers do follow the rules. They are as disgusted by the ones that don’t as any other person would be particularly because it casts a bad light on law enforcement in general. Both of these clowns should thank their lucky stars for voter apathy. Otherwise, there is no way they would ever get re-elected.